Like its meaty sibling, Endless Smile is so effortless to use that you’ll feel like you’re cheating. 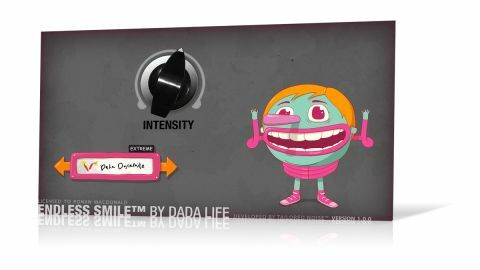 The second plugin from EDM production dons Dada Life follows up the lauded two-knob Sausage Fattener compression and distortion module with an even more reductive device. Endless Smile (VST/AU) is designed to turn any input signal (most pertinently, that coming through your master bus) into a rising build-up as its one knob - Intensity - is turned clockwise, leading into a drop as its snapped back fully anticlockwise. It might sound like a painful music technology blog’s April Fools news story, but not only is it real, it’s absolutely wicked. Like its meaty sibling, Endless Smile is so effortless to use that you’ll feel like you’re cheating. Seven presets (‘Fist In The Air’, ‘Face Melting Joy’, ‘Broken Teeth’, etc) set up an increasingly heavy hidden effects chain, the depth of which is adjusted with the aforementioned Intensity control. The carefully calibrated processes at work under the hood include filtering, delay, reverb, noise generation, saturation, and - most importantly - a barber pole frequency shifter. The last adds a rising tonality to some of the presets that brings the echoes, spatialising and filtering together beautifully. By manually operating or automating Intensity, Endless Smile really can turn anything into a build-up. Just winding it up over a cycling loop for eight bars, then slamming it to zero on the downbeat, makes it sound like you’ve put serious work into a drop that doesn’t actually exist. The catch, however, is obvious: it probably won’t be long before everyone’s using this thing, and each preset has a very characteristic sound, so producers looking to take advantage of Endless Smile’s spectacular build enhancement should do so before the world tires of it. DJs, on the other hand, have no such deadline to worry about - simply assign it to a MIDI controller and surprise the crowd by working new drops into classic tunes, or use it to plaster over even the most tenuous of mixes. Very impressive.